It's that time of year again -- all the fall catalogs are coming in the mail. Here's what Pottery Barn has this season that is steampunk influenced or appropriate to a steampunk home. First, the best two styling ideas from the fall catalog. 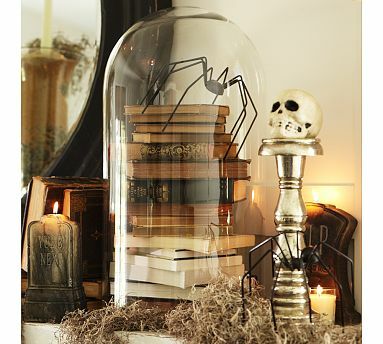 Halloween-y, but I liked the idea of stacking books under a glass cloche. Lastly, a kaboodle list with my choices -- some new, some have been around a while. As usual, some charming items! 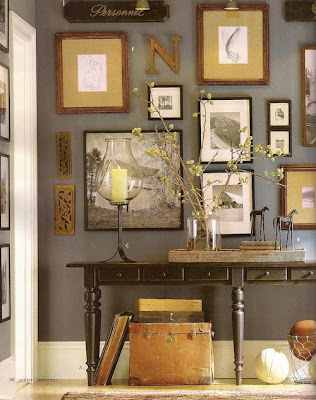 Thanks for the gallery wall post in particular, it helped me with a wall I'm planning. The gray velvet drapes are lovely but in 96" size are a bit pricey at $129/panel. A very decent alternative are the Fairfield Velvet Stripe drapes at Target, at $32.99/panel.They look great in one of our bedrooms. We went to the Edison Bar last night and I am so inspired today - I love your blog, please post more. I'm off to the Pottery Barn! Thanks.